Aikido de la montagne offers aikido for children from 4 to 12 years of age. Classes are divided by age and level. For children 6 years of age and older, we have three sessions per year, roughly aligned with the school calendar: (1) in autumn, (2) in winter, and (3) in spring. We have classes on the weekends or after school during the week. For younger children, 4 or 5 years and 6-year-olds, we have sessions of 6 weeks, on late Sunday afternoons (aikido mini). Please check our site for rates and session dates and for additional announcements (e.g., day camp). You may also join our mailing list by clicking here. For children 6 years of age and older, there is a Weekend or a Weekday option or a combined option. For 4, 5 and 6 year olds, we offer an aikido “mini” programme. Rebate for children in the same family in the youth classes: $20/session for the 2nd child; $30 for each additional child. For the Aikido Mini classes, places are limited. Please contact info[at]aikidodelamontagne.com if you are interested in adding your name to the waiting list. Rebate for children in the same family in the “mini” classes: $10/session for each additional child. For a complete list of fees and equipment, click here. For youth aikido (6 years +), no reservation is needed to register your child for classes. Please arrive about 15 to 30 minutes before class on the first day of the session. Please see the schedule for the session dates for the year. We accept registration during the first 4 weeks of the session. After the 4th week we suggest you wait until the next session starts. We have a rebate for additional children in the same family (see above). Children must wear a white gi (usually judo or karate style). The dojo has gis for sale. The youth program was established by Mohamed Mounji and approved by the chief instructor of the dojo, Claude Berthiaume Shihan. For 20 years we have provided children with the basics in aikido while keeping their needs and wants in mind. The youth program is not based on the excecution of specific skills. Our instructors patiently provide their expertise to help each individual child. If children enjoy their practice with others, integrate into the group while following the rules and etiquette of the dojo, and thrive, then we have the satisfaction of meeting our aims. Children, like adults, are all different and do not develop in the same manner. We would like children to concentrate on their own learning rather than comparision and competition with others. However, we instruct children to accept the help of their partners. By humbly accepting help from others, children will enhance their development. Additionally, we believe that cultivating the will to help others within a sprit of camaraderie, with patience and without judgement, will benefit everyone. The instructors show a demonstration of the techniques in a manner suitable for children, often more playfully than the demonstrations for adults, and within their reach. Over time, the practice of kata (movement sequences) with weapons (made of wood) has been incorporated into the youth program. Children enjoy this, and working with the weapons has been a stimulating way to work on aikido techniques and keep children motivated. The instructors oversee discipline in class. If there is a behavioural problem, the main instructor will decide how to handle it. For example, the child may be asked to sit at the edge of the tatami for a period of time. If the situation continues, after consultation among the instructors, the issue and possible solutions will be discussed with parents. Happily, in 20 years, we have never had an unsolvable behaviour problem. Occasionally children will be uncomfortable without their parents on the tatami. If you feel this is the case for your child, please consult with the instructor. If necessary, someone close to the child (parent, sibling; preferably with aikido experience) can accompany your child on the tatami. The role of the parent on the tatami is to reassure the child, and to help the child follow the etiquette and stay safe. When the child feels more comfortable, the parent can progressively become more distant and finally leave the tatami. These changes will arise naturally as children are encouraged to widen their comfort zone and to practice with more partners. Dojo etiquette is the same for everyone, children and adults, beginners and instructors. It reflects traditional Japanese values. As such, respect for partners and instructors is demanded. We also honor the memory of the Founder and past shihans. When entering or leaving the tatami (training mats), we do a kneeling bow (two knees on the mat, sitting on our knees, toes flat, back straight), then bending at the waist until our torso is horizontal, hands flat on the mat in front of us. When the instructor is ready to start the class, students line up for bows to the Sensei (instructor) and the Kamiza (shrine). If children arrive late, they must stand at the edge of the tatami and wait for the Sensei’s permission before entering. During the class, children are not permitted to leave or enter the tatami without asking the Sensei’s permission. Children will be told not to request such permission for trivial reasons. After the instructor demonstrates a technique, children should bow quickly to a child nearby without being selective about practice partners. Children must practice with everyone without discrimination. Children should bow to each practice partner before and after their practice together. Other rules apply, such as the following: It is important to have clean feet and short nails, to wear nothing which could harm them or their partners, and to have long hair tied back. Silence is requested during bowing and at all times children should not raise their voices so as not to disturb others. Children will be asked to care for their own equipment including folding their gis after class. Off the mat and throughout the dojo respect must be shown. We believe that a respectful attitude enhances relationships between the child and others. Until the age of 12, children may only attend youth program classes. After this age, and until the age of 14, students may ask about attending one (select) class for adults without additional costs. The instructor must be convinced that the child is ready (mentally and physically) to integrate well into the adult classes and the dojo chief instructor must agree. The following conditions must be met: (1) the child must continue to attend at least 1 youth class per week and (2) one of the youth instructors must be at the first few classes the child attends with the adults. If the child does not behave responsibly or is at risk of being injured, the child will be asked to stop attending adult classes. Once the child turns 14 years of age, he may join the full adult programme one year ahead of the regular 15 year standard with the authorization of a parent or guardian. The teenager rate applies. 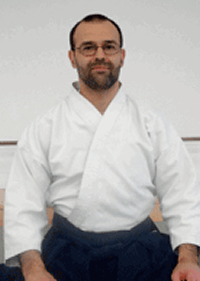 There are no tournaments or competitions in aikido, but, as for adults, children may take tests. Testing is an opportunity for children to demonstrate their technical level and their progress. At the start of each session, the instructor will ask children to mark their attendence (on the bulletin board). This allows the instructors to verify children’s hours for the test minima. The children’s program has 6 levels of belt color indicating increasing levels of technical skill and maturity. A minimum number of practice days is required beween exams. Tests are given approximately 3 times each year, at the end of each session. They take place at the dojo under the guidance of the course instructors and the dojo’s chief instructor. In addition to the minimum number of practice days, the child must have the permission of the head instructor for the children’s program, who assesses the child’s level of preparation. Sign up for our Aikido Youth mailing list!